Smart temperature transmitters, with their flexibility and enhanced accuracies, have become the number one temperature calibration workload for instrumentation professionals. Calibrating a HART smart temperature transmitter requires an accurate temperature simulator or temperature source, mA measurement, and a HART communication tool for calibration. You can use separate tools or a calibrator that integrates all three to perform this task. 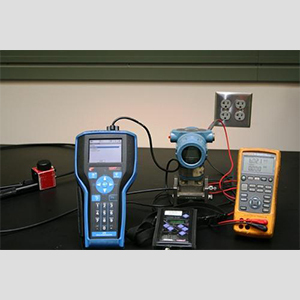 Before going to the field: Gather the needed calibration and communication test tools. If testing a RTD transmitter, be sure to bring extra test leads for connections. Testing a 3-wire RTD requires five (5) test leads, three for simulating the RTD sensor and two for measuring the mA signal. If using a separate communicator, you will need its test lead set as well. For thermocouple (TC) calibrations, be sure to have the correct TC test wire type with a mini-connector terminated with the correct TC connector type, (i.e. Type K wires and connector to simulate a Type K thermocouple). To get the required accuracy: As a rule, your mA measuring device and temperature source calibrator must be at least four times more accurate than the device being tested. To make that determination, the data sheets of the transmitter and the calibrator tested need to be considered. Be sure to take into account the temperature and stability (time) in addition to the accuracy of the specified device. Inako Persada provides full Temperature Calibration services that are accredited and/or certified in accordance with ISO/IEC 17025. Temperature Calibration services can be delivered at your site or at our lab. Accreditations for our temperature calibration service guarantees calibration results are traceable to the International Systems of units (SI) through NIST or NRC.